Doi Inthanon is part of the Himalayan Mountain Range and is Thailand's highest mountain at 2585m (8815ft) - dedicated to King Inthanon who has his ashes buried on the peak. If you are planning to visit the north of Thailand and like lofty spectacular views from a mountain top, this is just the ticket. It takes too long to get here by public transport for a day-trip. So unless you stay overnight, you either need to get here on your own transport, private driver or a guided tour from Chiang Mai. Visiting the summit is a very popular activity throughout the year, with over 12,000 visitors here on New Year's Day alone. Be sure to read the info section in the app and visiting options highlight for further info on getting here and how to avoid the crowds. Often shrouded in mist, the spectacular views from the peak are best seen in the early morning at sunrise, but Doi Inthanon National Park is not just about Thailand's tallest mountain. 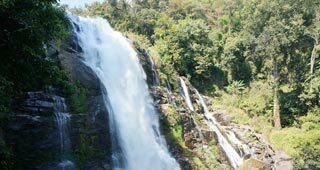 The park covers an area of 482 sq km (186 sq miles) and within its borders; it contains Karen and Meo Hmong villages of over 4,500 people, many notable waterfalls (see highlights), and a varied climate with several diverse ecosystems. 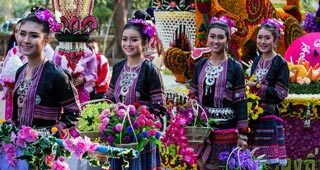 Two villages that are worth visit are Ban Mae Ab Nai Karen Village and Khun Ya Noi Hmong Village. These visits are probably best arranged through organised tours from Chiang Mai. Two picturesque Chedis at Km 41.5 which were built in 1992 to commemorate the fifth cycle birthdays (60 years) of King Bhumibol and Queen Sirikit (the former King and Queen), which sit atop nearby twin peaks. Inside the pagodas are Buddha relics and beautiful Buddha Images. From the outside, there are some spectacular views and beautiful gardens. For the nature lovers amongst you, there are a number of nature trails in the park. One of the most popular is the Kaew Mae Pan Nature Trail which starts a little north of the two chedis dedicated to the King and Queen at km 41.5. The trail is quite well maintained and the 2.5km circular walk is a moderately easy trek - part of it along the mountain ridge with breathtaking views to the west. Guides are compulsory at 200B per guide, and you will find them waiting for work at the trailhead on the main road. This trail can get very busy with tour groups. There is another short nature trail which starts opposite the ranger station on the main road leading to a sphagnum bog, which is an excellent location for birdwatching. Doi Inthanon is usually done as a day trip but there is a campsite and some bungalows to rent near the HQ. 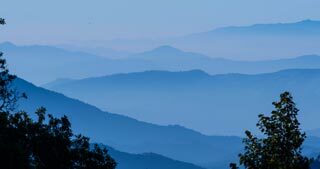 Doi Inthanon is part of the Himalayan Mountain Range and is Thailand's highest mountain at 2585m (8815ft) - dedicated to King Inthanon who has his ashes buried on the peak. Winding Highway 1009 runs for many kilometres through the National Park, and there are many turn-offs to the various attractions within the park along it, identified by the Km road markers. The mountaintop is located at Km 48 at the end of Highway 1009. The park is a riot of wild flowers and blossoms - especially the pink Sakura flowers covering trees during late January and February. The moist and dense evergreen cloud forest is made up of dry evergreen, pine, teak and dipterocarp (tall hardwood) forests and there are vast areas of sphagnum bog (moss peat). For the bird watchers, there are 362 species of birds, and for animal lovers, there are still 65 different species of animals to be found (of which half are bats), including wild boars, Gibbons and deer. As if this isn't enough, there are also two picturesque Chedis at Km 41.5 which were built in 1992 to commemorate the fifth cycle birthdays (60 years) of King Bhumibol and Queen Sirikit (the former King and Queen), which sit atop nearby twin peaks. Inside the pagodas are Buddha relics and beautiful Buddha Images. From the outside, there are some spectacular views and beautiful gardens. The Headquarters and Visitors Centre Located at Km 30.8, close to the Hmong Meo tribe village of Ban Khun Klang. Facilities include an ATM and a nearby market with a few eating places. Here you can obtain maps, further details about treks and other activities in the park and also book accommodation, although this is best done in advance. Check out our ‘Visiting Options’ highlight for further info on ways to visit and a potential itinerary and also the ‘Doi Inthanon Waterfalls’ highlight.